Cache Cache is the ready-to-wear fashion brand which puts optimistic and ambitious women in the spotlight. Resembling them and their daily life, Cache Cache thus allows them to express their personality by offering them an accessible, trendy and feminine fashion. The brand is a firm favourite, with clothing and accessories which enhances the assets of everybody and boosts morale! 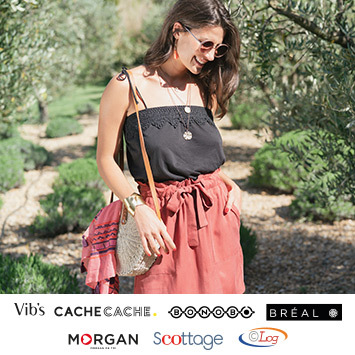 In order to make its campaign aimed at ambitious women more concrete, Cache Cache is a partner in the Capjeunes programme of the France Active association. A solution which allows young women under the age of 26 to benefit from greater support and a start-up bonus of 2000 € to set up their business. A system supported by rounding up at the cash-desk which allows our clients to make a small donation 100% of which is reimbursed to the association.